The future of Rye Playland is all wet. Westchester County Executive Rob Astorino announced today that a water park will be added to the amusement park. A new operator, Sustainable Playland Inc., will run the park. In addition to the water park, the new operator will add a “Great Lawn” facing the Long Island sound. The space will be suitable for hosting events like graduations and concerts. They will also add ball fields and a field house. The new operator will also make $34 million in capital improvements to the existing park. Astorino has complained that Playland is losing more money than taxpayers should have to cover. He said last year that closing the park could save $2 million a year. Playland is a National Historic Landmark and opened in 1928. It was featured in the 1988 Tom Hanks film “Big.” Among its famous old rides are the wooden “Dragon” roller coaster and a high-speedcarousel, which will remain at the park. Allow Adults of Kiddie Coaster for $10 Each. They'll be swimming in cash. "Among its famous old rides are the wooden “Dragon” roller coaster and a high-speedcarousel, which will remain at the park." I have to it this line concerns me. It can be construed that much of the existing park will be gutted to accomodate the changes in adding a water park and Great Lawn. I thought much of the surrounding land was protected wetlands. Here is a website detailing proposed changes. It would appear that almost all of the park to the left of the central midway is being preserved, minus the Zombie Castle which unfortunately looks like it will be demolished to allow the Yo-Yo and Kite Flyer to be moved from the right side. All other rides on the right side, minus the Grand Carousel, look like they will be removed. Thanks for the images. That's pretty much what I envisioned. Last edited by larrygator on Fri Oct 12, 2012 10:21 am. Nice to see a park expanding and investing in its future. As a local, I'm glad the park isn't going away but I'm not sure I love the changes. If they get rid of most of the rides I think attendance will drop like a rock (though the water park idea may help a lot). Also if you have such a limited amount of space for rides, why on earth is Superflight one of those rides? It's horrible. I'd suggest they give that the axe and move some rides into it's spot (Maybe take your pick of the Gravitron, Skyflyer, Wipeout and/or if possible the S&S tower). They can charge just as much for those as they do for Superflight and make a lot more money. Also... I really hope they find a way to keep the flume. It's the best ride in the park in my opinion (with the Old Mill being a close second). Since they're planning on having a water park, I wonder if they'll find a way to keep that and/or playland plunge which are both extremely popular rides. ^ *We* know superflight is horrible, but the GP eat it up because it looks like a unique and interesting ride and they can charge a higher ticket amount for it. disneyfan1313 wrote: ^ *We* know superflight is horrible, but the GP eat it up because it looks like a unique and interesting ride and they can charge a higher ticket amount for it. And you have to look at it from a ROI standpoint. It needs to stay at least a few more years to make some of the investment back before it can be upgraded. A company interested in running Rye Playland presented its proposal to the Westchester County Board of Legislators on Thursday, a month after County Executive Robert Astorino chose another company to run the county-owned amusement park. An executive from Standard Amusements said it would invest $25 million into the beloved but aging park, including a $6 million upfront payment to the county, said a statement issued by the board. “Their ideas for reinventing Playland were certainly impressive, and this goes to show that a completely transparent process for deciding this iconic park’s future is in the best interests of the county’s taxpayers,” said Legis. Catherine Borgia (D-Ossining). Democrats who control the board have been critical of Republican Astorino’s choice of Sustainable Playland, a nonprofit organization that would invest $34 million into the park and give the county a $4 million upfront payment. In the statement, Board of Legislators Chairman Ken Jenkins (D-Yonkers) said he and his colleagues wanted to hear from New York City-based Standard Amusements as well as New Jersey-based Central Amusements because ultimately the board needs to approve any private operator that would run the park on behalf of the county. Astorino claims he has the authority to sign an agreement that would allow a private group to run the park. An executive team from Standard Amusements presented their plan to revitalize Playland to the Government Operations Committee (GO) of the Westchester County Board of Legislators (BOL) today, showing in detail how their proposal would maintain the historical amusement park and recreation facility’s attraction and charm while upgrading elements and operations to increase financial viability—and decrease costs for county taxpayers. Last month County Executive Robert P. Astorino announced that he’d chosen a proposal from Sustainable Playland, Inc. (SPI), a Rye-based not-for-profit, to operate Playland beginning next year. 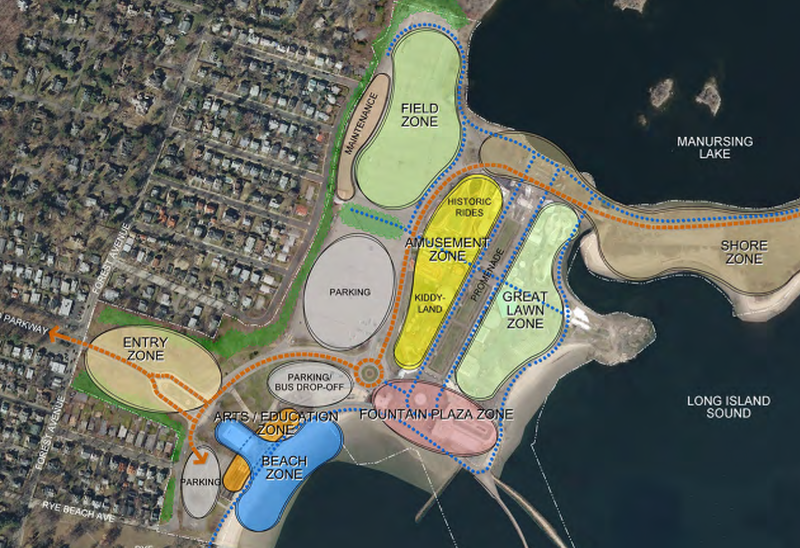 But a number of questions were raised by the proposal, and the SPI management team subsequently met with the BOL GO as part of the BOL’s due diligence to review all of the proposals, as the BOL must approve any agreements regarding Playland. The GO plans to hear from the other groups who had submitted proposals to operate Playland as well. “I am pleased that the Standard Amusements team was able to share its proposal with us today,” said Legislator Catherine Borgia (D-Ossining), chair of the GO. “Their ideas for reinventing Playland were certainly impressive, and this goes to show that a completely transparent process for deciding this iconic park’s future is in the best interests of the county’s taxpayers.” The Standard Amusements team had sought to present its proposal to the BOL in March 2012 but was told by the Administration that doing so could potentially disqualify them from the RFP process. As described by Nicholas Singer, a Harrison, NY native and co-founding partner of Standard General, the investment firm behind Standard Amusements, the proposal would include a $25 million investment (all of it now “on-hand”) into Playland—a $6 million upfront payment to the County and the remaining going toward interest on County debt and capital expenditures. Singer stressed that the Standard Amusement plan would greatly improve Playland without altering its mission, footprint or historical integrity. The park’s employees would also be retained. Standard Amusements CEO is a renowned amusement park operator with over forty years of experience in the industry who led the successful turnaround of a number of amusement parks, including Great America in Santa Clara, California and King’s Dominion in Richmond, Virginia. The Standard Amusements plan calls for a comprehensive facelift for Playland, improved food operations, more games that cultivate inter-generational experiences, increased use of the park for live entertainment and seasonally-themed shows, plus better marketing of the park. “It is obvious that both of the proposals presented to us look toward boosting the future success of Playland and erasing the County’s financial obligations there as well,” said Legislator Judy Myers (D-Larchmont).